This i picture from April 2015 with the kids having some fun! Merry Christmas and Happy New Year 2019. Captain Mel and My Mistress Charters wish everyone a great Christmas Please enjoy this time of year and the Holidays. Give us a call for early discounts for booking your Fishing trip for 2019. Thanks to all the Customers that fished with us this year It Started late this past May but the fishing was totally awesome Kings were stacked up and a lot of fish were caught. 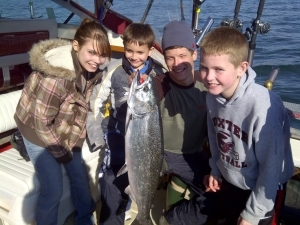 June thru August we were able to stay up with the movement of the coho and lake trout as they move around the lake. We did not see a lot of Kings this August or Sept. Because of the water temps staying to high. But fishing is fishing. I hope everyone had a great year and wish we may see each other again in 2019.